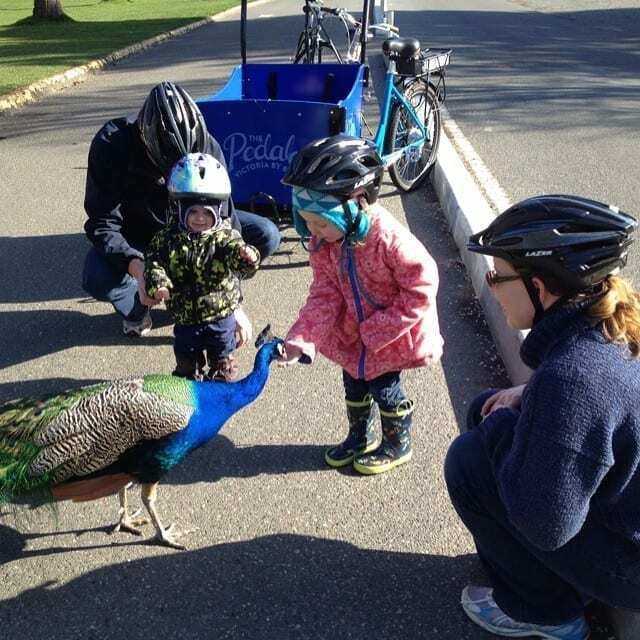 Could any trip be more kid friendly? A BC beachside vacation, combined with a tour of a family farm and an artisan cheese factory. 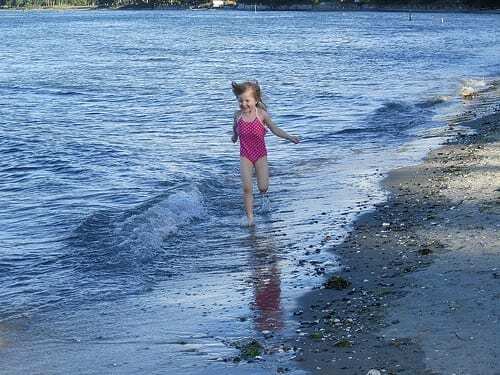 Vancouver mom and blogger Amber Strocel and husband Jon recently returned to Parksville, BC with their kids Hannah, age 5, and Jacob, 22 months. 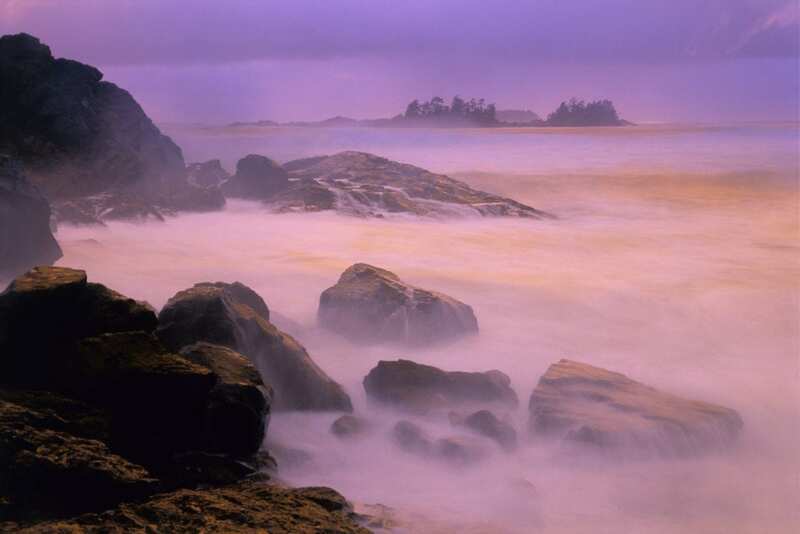 Parksville is about 45 minutes north of Nanaimo on Vancouver Island, and one of Strocel’s favorite vacation spots (she’s been to the retreat three times now). And after reading over their vacation, I’m jealous! 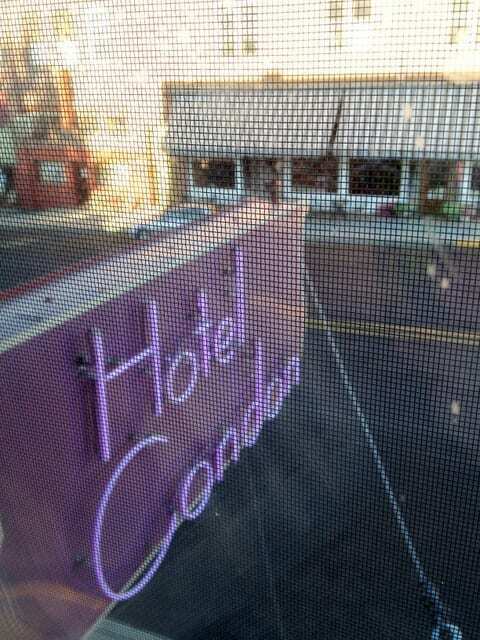 I’m ready to book my stay – read this over, and see if you’re not ready to go, too. Where are you staying? 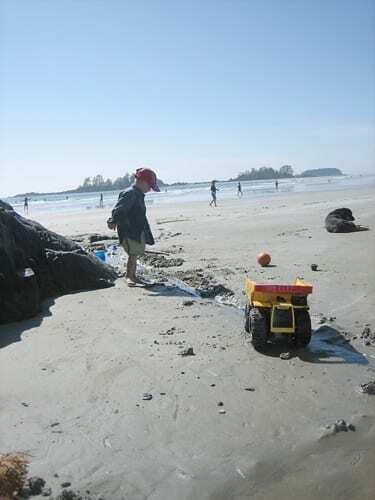 Did you find a family-friendly Parksville, BC, hotel or other Parksville accommodations? We stayed at the Beach Acres Resort. We really like it. It’s right on Rathtrevor Beach, which is quite possibly the best beach ever. All of the units have a full kitchen, so we can cook our own meals. We have a two-bedroom townhouse with an ocean view, and it’s very affordable and really spacious. The resort also has a pool, playground, tennis courts and beach toys for the kids to use. 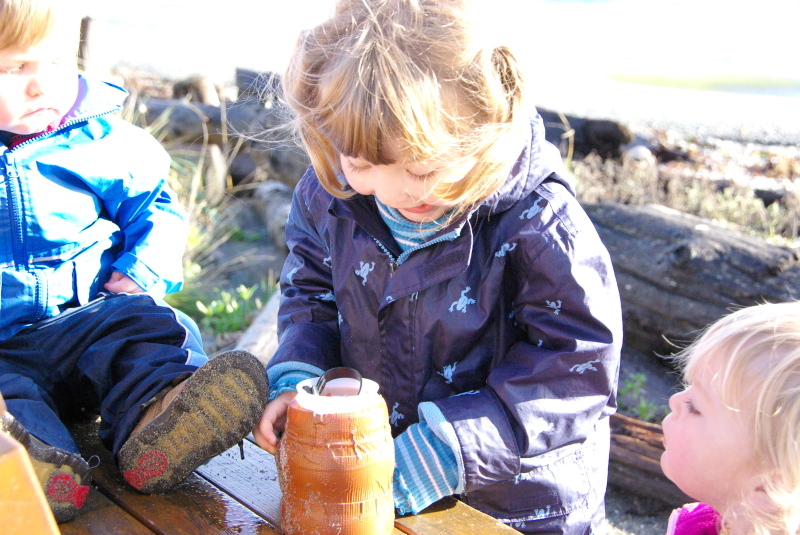 What kinds of family activities do you enjoy on a Parksville vacation? What kinds of things do you do with kids in Parksville? 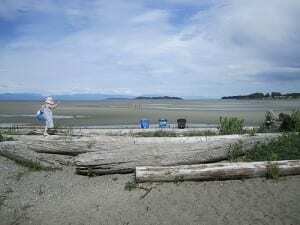 We love Rathtrevor Beach. It’s very sandy, and has amazing low tides and very warm water. At low tide you can walk forever, exploring the tide pools. And at high tide, the water is the warmest in Canada and not too deep. If you’re not staying in one of the resorts on the beach, you can visit Rathtrevor Beach Provincial Park for the afternoon, or for camping. 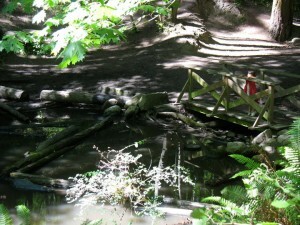 Lions Venture Park in downtown Parksville is a not-to-be-missed playground. It is one of the biggest playgrounds I have ever seen, with an incredible variety of playground equipment. 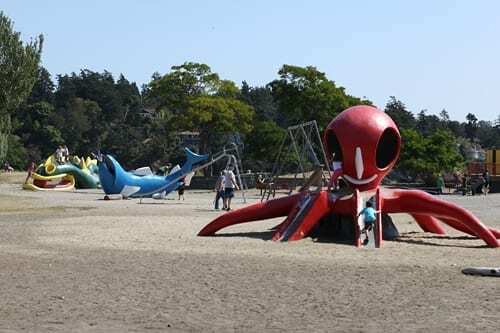 There is also a water park and a concession, and it’s right on Parksville’s main beach. During the summer there is a sandcastle competition in the park, as well. The Old Country Market in nearby Coombs is also a must-see. There are goats on the grassy roof, and people come from all over to see them. The market itself is amazing. It has grocery store including a deli and bakery with some of the best pies going, toys, dishes, hats, bamboo cutting boards and cooking utensils, hammocks, rugs, art and other things I’m sure I’m forgetting. There’s also a restaurant, an ice cream stand, a produce stand, a garden centre, clothing stores, a surf shop and a bunch of other shops in the open street market. Adjacent to the Old Country Market is the big, open plaza, with a collection of statues that the kids can climb on. 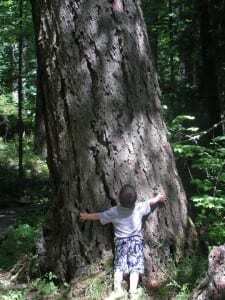 Coombs is only about 10 minutes away, and it’s totally worth the drive. The other fun thing about Parksville is all the deer. Local gardeners don’t enjoy the way they eat their plants, but kids think they’re so cool. They’re pretty comfortable around people, too. During four days in Parksville we’ve logged six deer sightings. 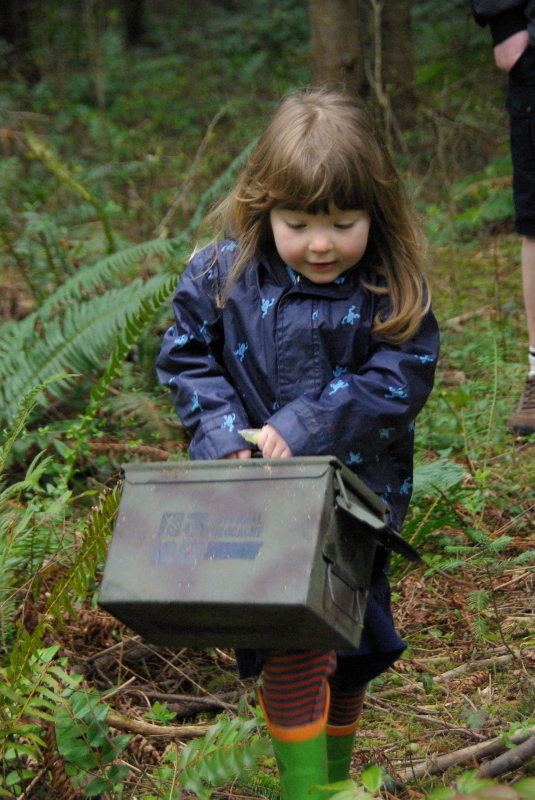 My toddler learned the word ‘deer’ pretty early on. Can you recommend any Parksville restaurants? We haven’t really eaten out in Parksville, because we have the kitchen to use, and we have an almost 2-year-old kid. I can say that the last time we were here that Lefty’s in Parksville and Qualicum Beach was really good, and pretty kid-friendly, too. You visited a Vancouver Island farm with kids, right? Yes, we went to Little Qualicum Cheeseworks, which is located on Morningstar Farm. I would totally recommend Little Qualicum to others, especially people who are interested in local food, and cheese in particular. Little Qualicum produces some artisan cheeses, and lots of amazing spiced and flavoured cheeses. They use raw milk for their aged cheese. This is really quality crafted cheese. And the berry wines, also, are one of a kind. Can you tell me more about your Little Qualicum cheese factory tour? The tour is self-guided, and we spent about 30 minutes. There is a half-hour walk around the farm that we didn’t take, because of the ages of our kids. The farm is well laid-out with maps in the farm store and lots of signs, so you can really structure it for your family and your children’s attention span. They also have guided tours on the weekends, and for large groups. They have samples of all the cheeses in the farm store. I tasted at least six different kinds. My kids were big fans of the cheese curd, which makes a fun squeaky sound when you eat it. It’s made every Thursday, so we were able to have some super-fresh curd by visiting on a Thursday. 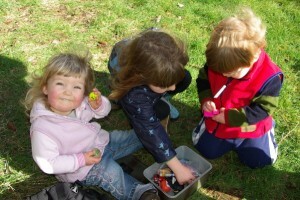 What do your kids like best about the farm and cheese factory? 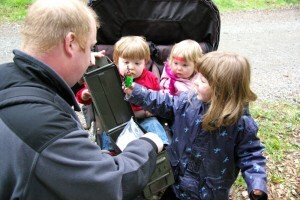 My kids most enjoyed seeing the animals. Kids can go into the bunny enclosure with the rabbits, and that was the highlight for my 5-year-old. There were also calves and goats in their own enclosures. 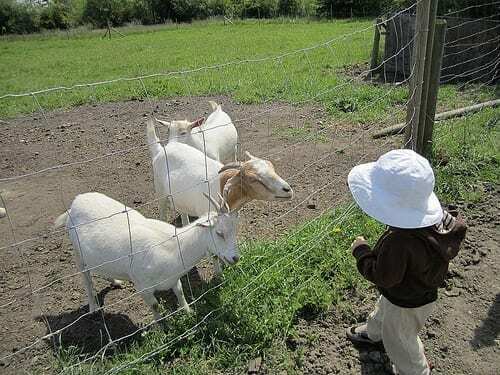 My toddler especially enjoyed the way that one goat stuck its nose through the wire fence and nibbled on his hat. I didn’t as much (I like the hat!) but Jacob cried when we took him away from the goat. For them, the visit was less about the cheese and more about the farm animals. 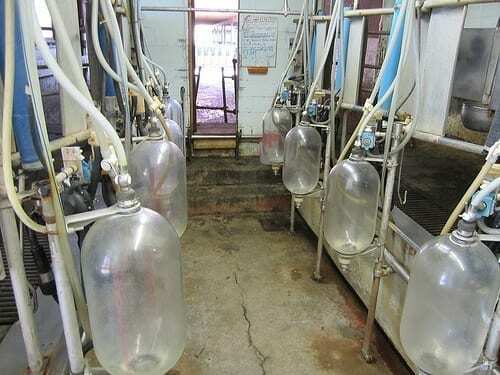 As part of the tour you can see how the cows live, walk through the milking parlour where all of the milk comes from to make the cheese, see the pigs they raise for meat and peek into the window and see the cheese being made. You really get a glimpse into a fabulous local food producer. And it’s fun for kids, to boot, with animals to see and an old tractor to climb on and cheese to eat. 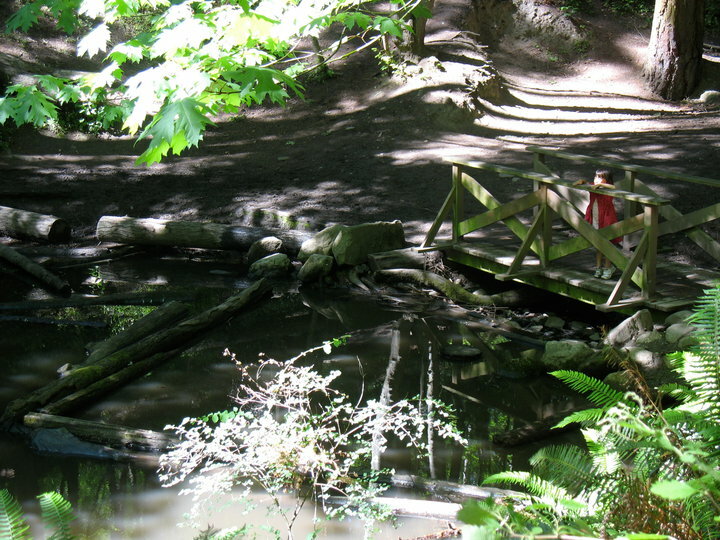 What’s the best age for visiting a kid-friendly farm in British Columbia? I think that the best age for visiting Little Qualicum would be around 4-10. My toddler had a good time, but keeping him out of cow patties and keeping him contained in the farm store was a challenge. Also, I was somewhat concerned about him around the electric fencing that is used on the walk around the farm. That was one reason we didn’t attempt the walk, actually. So, you’d recommend it? Is there anything you’d do differently next time? The farm is on my list of must-see things in the Parksville area. If I were to do anything differently, I might show up on a weekend because they have ice cream on the weekend, as well as guided tours. My 5-year-old was disappointed that there was an ice cream stand and no ice cream. 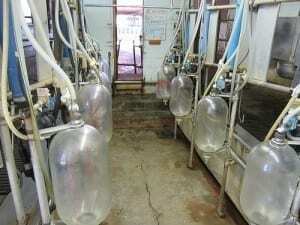 This is a working farm, and you are visiting someone’s home. You can expect to be in the midst of farm activity and farm animals like dogs and cats. You are getting a real picture of what’s happening on this farm. But it’s also important to respect the work that’s happening around you, and to be considerate of the family that lives there. Thank you, Amber! Read more about Little Qualicum’s sustainable practices on Amber’s blog. 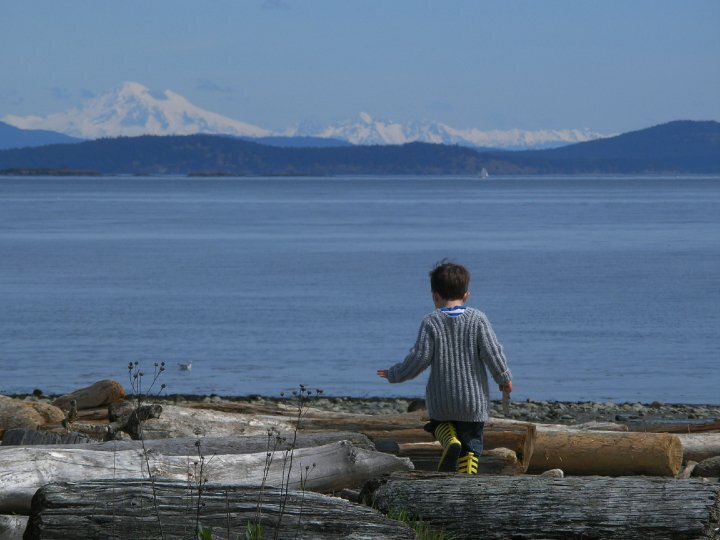 Read more about family-friendly Parksville at the Qualicum Beach & Parksville BC Tourism website. Read 49 Things to Do in Parksville from BC Tourism.